It’s Monday morning. I woke up early to get some work done before school, arriving at 6:40 AM. I have almost an hour before the day officially starts. I log on, type in my password, and see the worst possible response: Server tree not found. I rush to another room, another computer, anything! But there is no hope--the internet is down! I immediately make phone calls and send texts in a panic--even sending out my favorite new Bitmoji for bad news--however will I teach? Game over! Or is it? And should it be? I love technology. I want to use purposefully to change teaching and learning, and almost every day, I think I do. But technology is a tool, and needs to be used with purpose and for effect. Teachers need to plan, have concrete goals, and solid expectations for student learning and achievement. And we also need to be able to adapt, change things on the fly, and sometimes, make a shift back to the stone age. The US Office of Educational Technology and the Obama Administration wants every students to have an internet capable device in school and at home, but this isn't a reality yet. Even in a district like mine, where tech is the norm and the WiFi is a given, we have problems. Not all our systems have the necessary infrastructure yet. Sometimes, there are problems outside of our control. 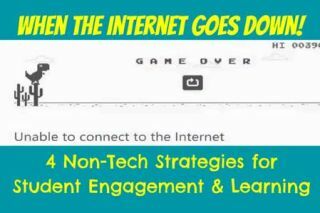 Yes, we should be able to depend on consistent teaching enviornments, but days without the internet also make me think about what a crutch technology can sometimes be. Before you use technology, ask yourself whether or not it’s necessary, purposeful, or changes teaching or learning. If not, don’t give up on the tried-and-true strategies that have worked for so many years. I love change--and there’s so much wrong with education today--but there are also valuable things we do right, and many don’t need technology. Do you ever miss the days when students created a poster? A brochure? Something hands-on without the computer? In my high school classes, those days are long gone. Now, the activities I named above usually lack an authentic audience, but I think there’s a lot of value in hands-on creation. I think about my day with the #MarshmallowChallenge (seeEverything I Know I Learned From the #MarshmallowChallenge) and learning in maker spaces. Why not bring hands-on learning and creation into your classroom? Focus on students doing something, and then presenting it to their peers. Technology is often a complete crutch for students who lack presentation skills. Build these skills before allowing the comfort of the Smart Board or other presentation tools. So much of the Common Core focuses on arguments and evidence-based claims. Debate, argue, and defend ideas over any number of topics. Which math skill is the hardest? Why? Who would make a better president? Would you rather live in outer space or under the sea? Last year, I had students work in groups to craft arguments in ten minutes and then held mini-debates in class. Their peers voted on a winner and gave feedback. Just this week, I scrapped my plan for a written anticipation guide and had students get up, move around the room, and defend their ideas. We shifted across the room, standing in a line representing the strength of our opinions, agreeing and disagreeing with statements from the text. Metacognition and reflection are essential for learning and growth. Have student reflect on learning, formally or informally. Whether it’s through a brief survey or discussion, or a more formal reflection or portfolio, any time students think about their progress is meaningful. My students just wrapped up research presentations introducing the Holocaust, and they evaluated their successes, learning, and challenges with this form. Also consider exit tickets, what stuck, or another type of synthesis, assessment, or reflection tool. Make sure students are clear about what they learned (or should have learned) in class so you are clearer about how to move them forward. What are your favorite non-technology tools, strategies, or activities? How do you feel on that dreaded day when the internet goes down?